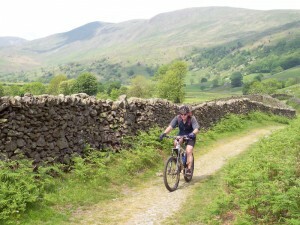 This is a mountain bike route of 22 miles that starts from Staveley in the Eastern Lake District. While it eases you in gently this route contains some very hard riding. 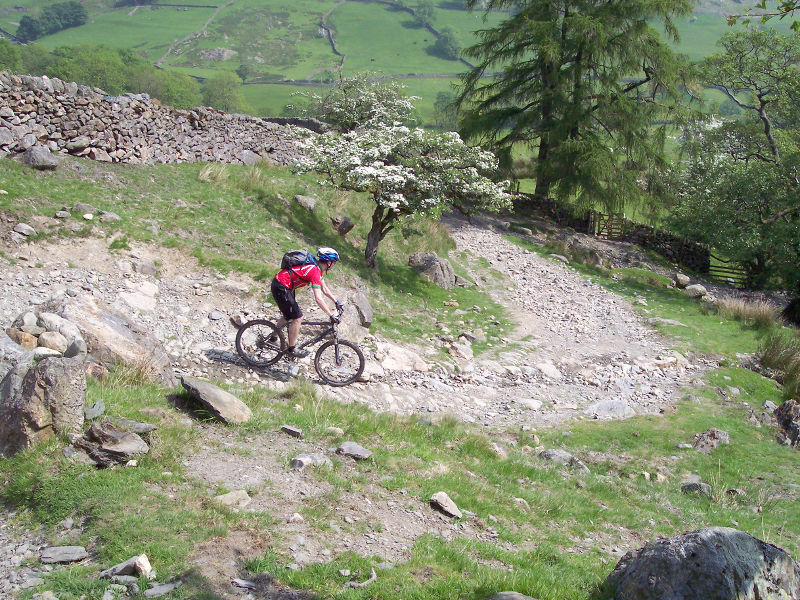 The second half of the ride includes lots of technical riding on steep, loose boulders that will test your skills and have your arms and legs burning. 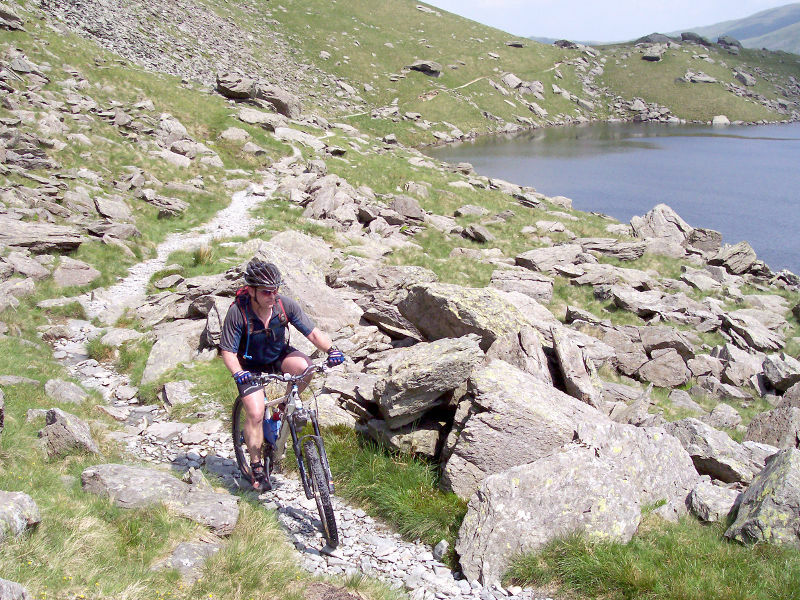 The Nan Bield Pass and Gatesgarth Pass climbs are also long hike’a’bikes. 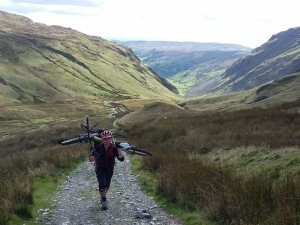 But the descents are fantastic and the views stunning, so if that sounds like your kind of thing read on. 1. Start from the Mill Yard car park behind Wheelbase Cycles in Staveley(GR471983). Exit the car park and go past the first lane on the right to the junction with the main road through the village. Turn right and follow the road to a short way to the next junction. 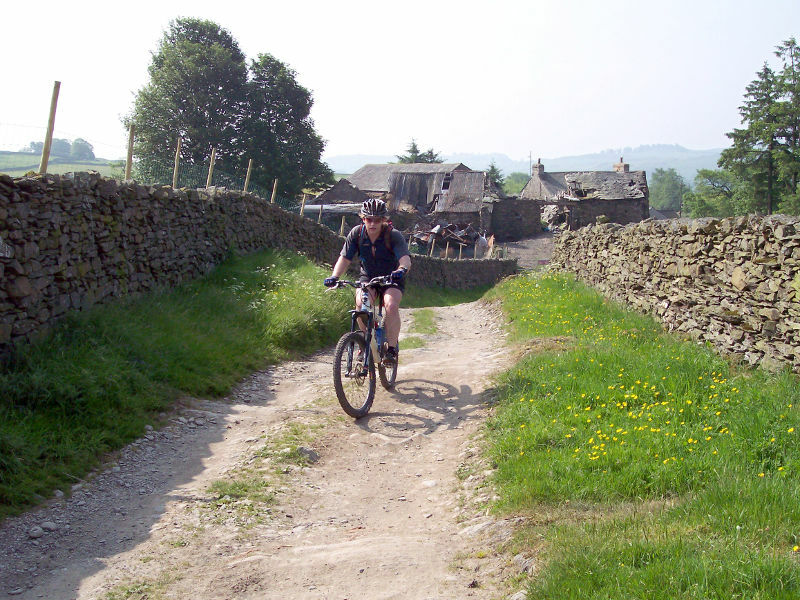 Turn left and follow the road through the village, in the direction of Windermere, towards a junction with the A591. At a junction at the edge of the village, where the main road turns left to meet the A591, go straight on up the dead end lane in the direction of the signs for Cycle Route No 6. Where the lane ends follow the cycle track ahead through the trees, and then along the right hand side of the A591. Go past a driveway on the right to a junction with lane on the right (GR451987). 2. Turn right and climb the steep lane between the drystone walls. Go straight on at the next junction and continue climbing to a farm. At the farm follow the tarmac 90deg left, then right. At the following junction turn right to the next farm. 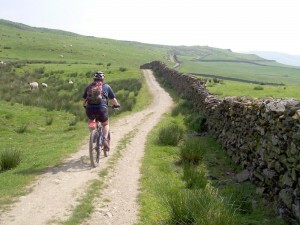 On reaching the farm turn left along the rocky double track that gently climbs between the drystone walls. 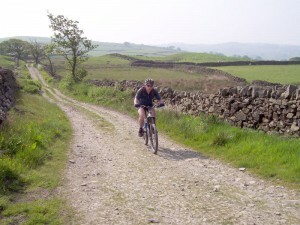 Continue along this track, past a junction with a lane on the right, to where it finishes at a T-junction. Turn right and climb the rocky double track to a gated junction (GR440009). Go through the gate on the right and follow the track along the line of the wall on the left. This track bears left and climbs through a couple of gates before bearing right and coming to a gate, directly after a stream crossing (GR443027). Go straight on through the gate and up a short climb, then along the undulating track following the drystone wall on the right. The track eventually turns left for a fast, loose, rocky descent to Kentmere Hall at the bottom (GR451042). 3. At the bottom bear right to ride past the farm of Kentmere Hall and along the track that leads across the valley towards the church. Go up a short climb to the junction by the church then, at the top, go straight on and descend to a bridge over the stream at the bottom. Go straight on over the bridge to a junction with a singletrack lane on the left just after (GR458039). Turn left and climb the lane to where it ends at a T-junction. Turn left and climb the lane all the way at a gate at the crest. After the gate descend the lane to a left hand bend with a wide gravel byway on the right signed to Sadgill (GR465050). 4. Turn right and climb the rocky double track through a few gates. Follow this track all the way to a gate at the top in a saddle between the peaks. Go through the gate and descend the double track down the other side of the hill. Take care of your speed on this descent. 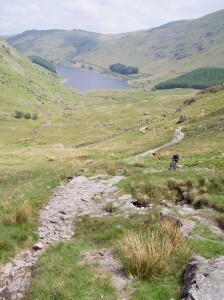 About halfway down the track bears slightly right to follow the course of a stream. Very soon after this is a sharp left hand corner. Overshooting this corner will put you into deep the rocky stream. After the sharp left descend the steep cobbled bends to a junction at a gate (GR481051). 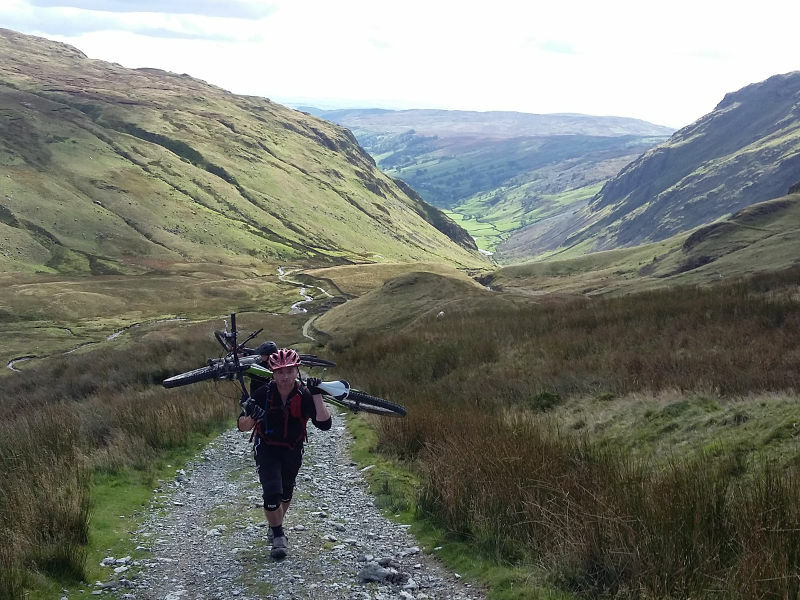 Bear left through the gate and descend the loose, rocky track all the way down to the buildings of Sadgill at the bottom (GR482057). 5. 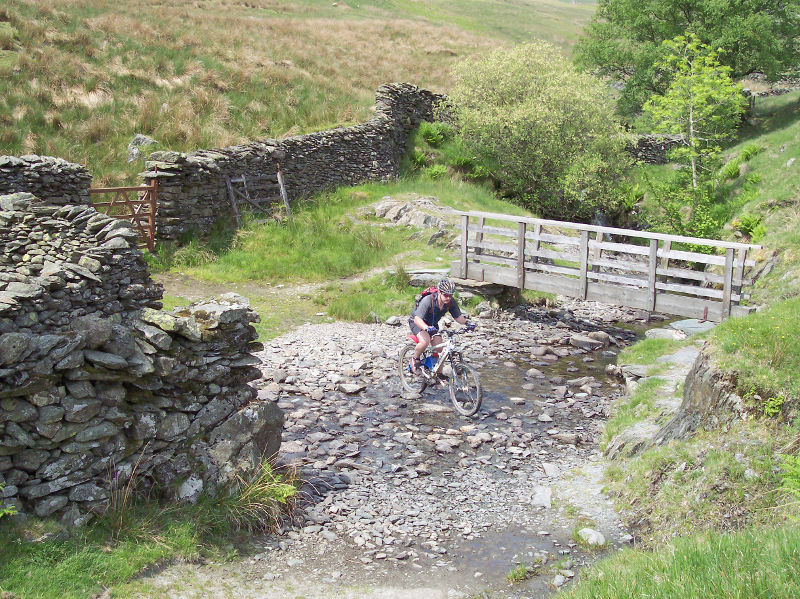 Go through the small gate at the bottom of the descent then bear left to a lane then turn right and cross the bridge over the River Sprint to a junction (GR483057). 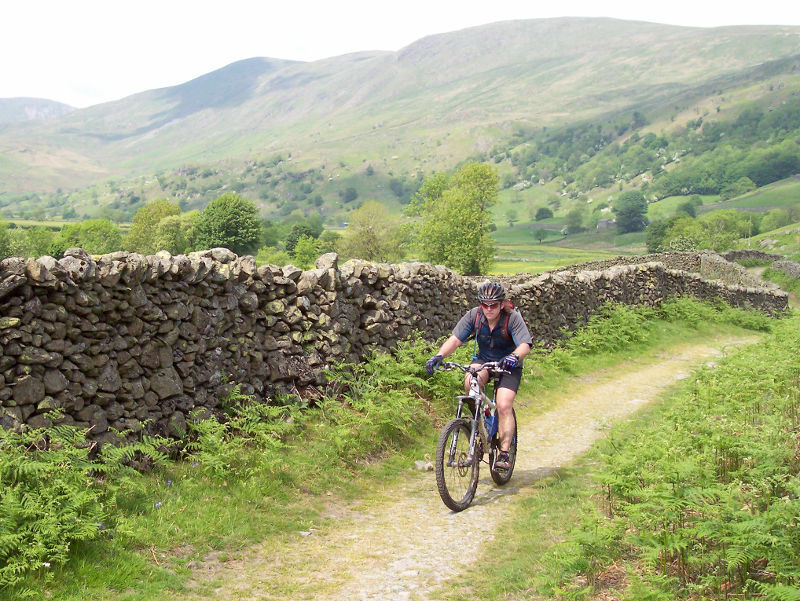 Turn left and climb the wide, rocky track between the drystone walls, up the right hand side of the valley of Long Sleddale. The climb begins as a gradual incline but it kicks up as it claws its way out the head of the valley eventually coming to some very steep bends, paved with uneven boulders. 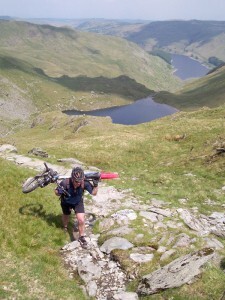 Climb these steep bends for some time to a gate. Go through the gate then follow the track left across a small plateau, past a signed but vague bridleway on the right, to the gate at the bottom of a steep winding track (GR478084). 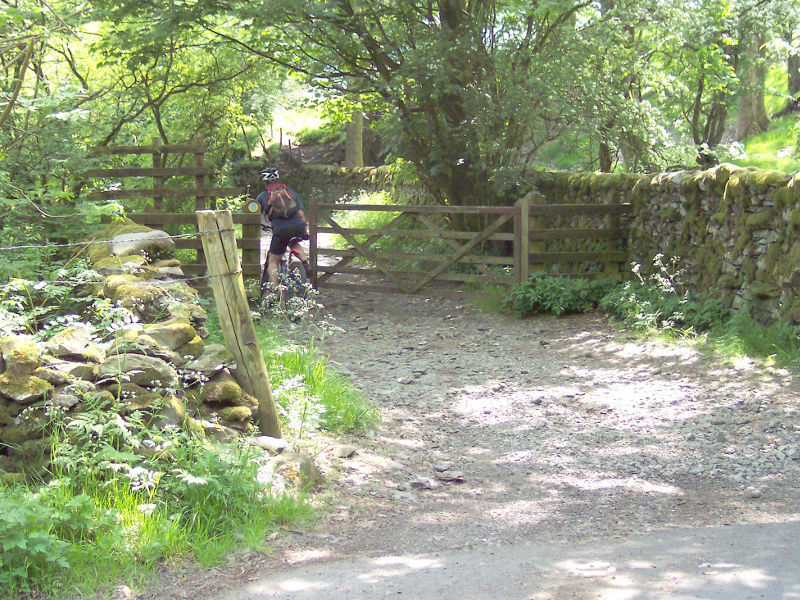 The gate at the bottom of this track has a no access sign for motor vehicles and horses but this does affect bikes. 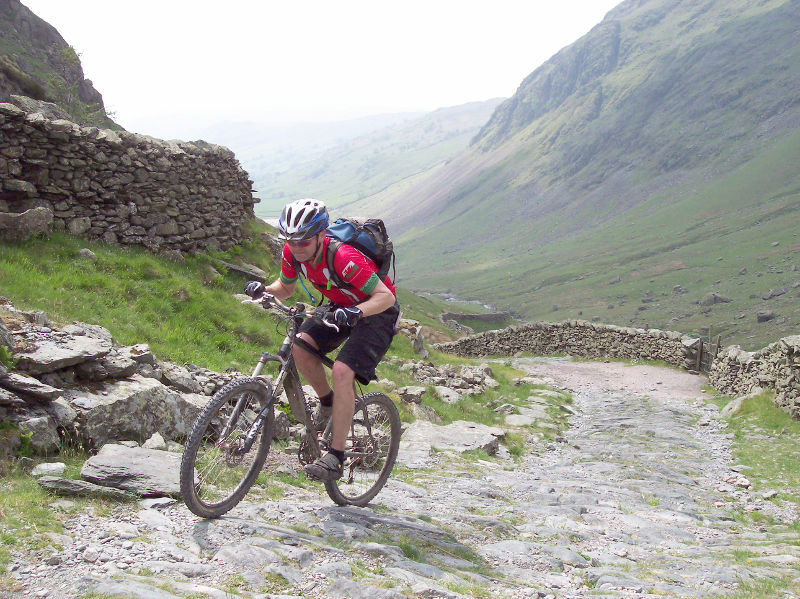 After the gate follow the steep, rocky double track for a push to the top of the Gatescarth Pass. 6. After reaching the top of the climb descend a short way to a gated junction (GR474092). 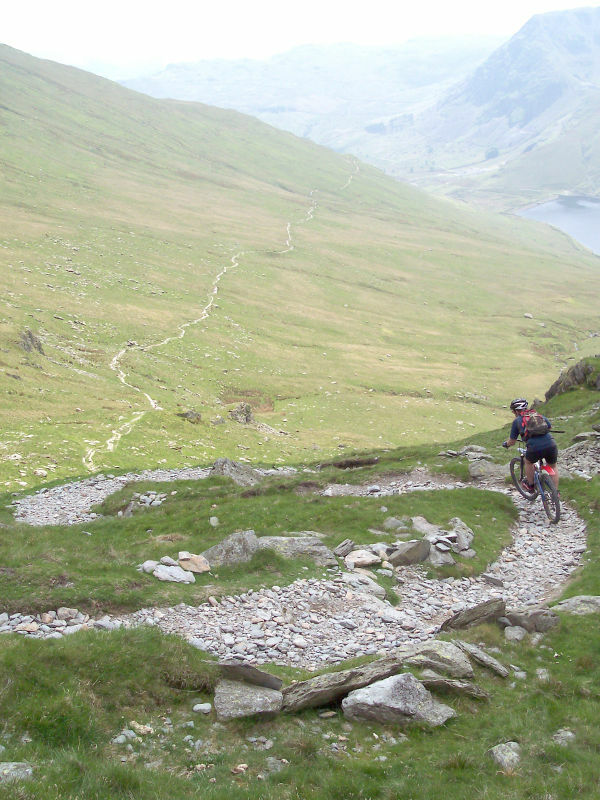 Go straight on across the junction for a steep, technical, very loose and rocky track that descends through a number of tight switchbacks to Haweswater. Your arms and legs will probably be burning at the gate ¾ of the way down. 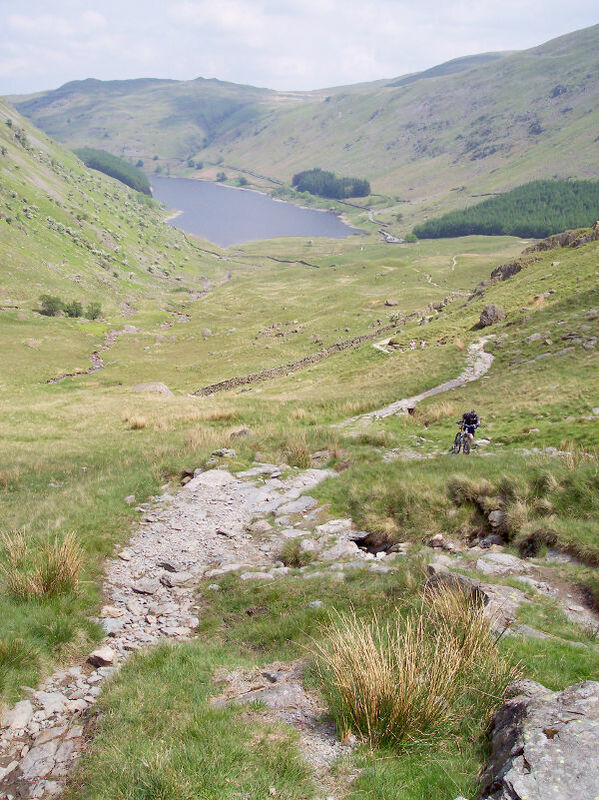 Go through the gate and continue descending to a junction a short distance before reaching the car park on the edge of Haweswater (GR468107). 7. At the junction turn left and start climbing towards the waterfall, heading up the left hand side of the valley. 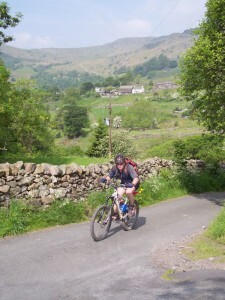 This is the start of the Nan Bield Pass climb, another long hike-a-bike. Although the trail starts out rideable the boulder sections just get bigger and steeper. Climb and push up the track on the left hand side of the waterfall to Small Water, halfway up. At the lake go right on the stepping stones across the stream then follow the technical but rideable singletrack anticlockwise along the water’s edge. This is a short respite from the hike-a-biking and all too soon it's time to shoulder the bike again as a track climbs the steep, boulder strewn slope. Although it is a slog the top does get visibly closer every time you look up. Near the top, after negotiating a tricky slab, the trail heads left before turning right and reaching a stone shelter and junction in the saddle on the ridge, a good place to stop and regain some energy for the descent (GR452096). 8. Go straight ahead over the footpath on the ridge and descend the rocky track that can be seen snaking off into the valley, a great sight after all that climbing. 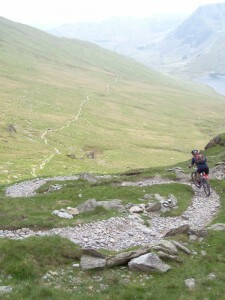 The descent starts with some steep, technical and very loose switchbacks. 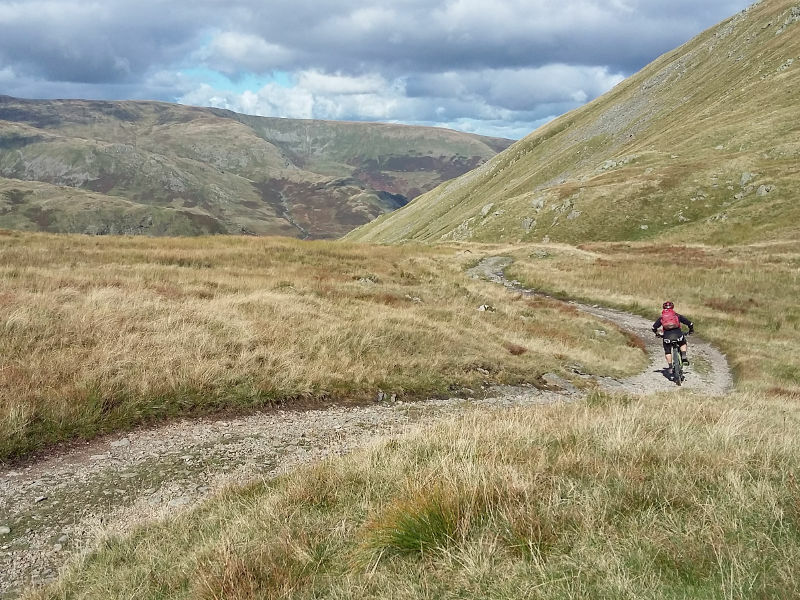 This leads on to a great section of boulder covered singletrack that traverses the side of the fell above Kentmere reservoir, on the right. 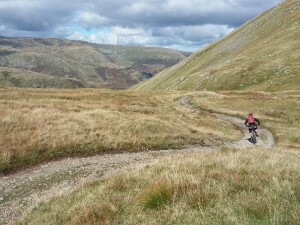 Eventually the trail kicks up, bearing slightly left, for a short climb over the shoulder of the fell. After the crest descend the fast grassy trail, which is a little vague in places but hard to lose as there is only one trail to follow. 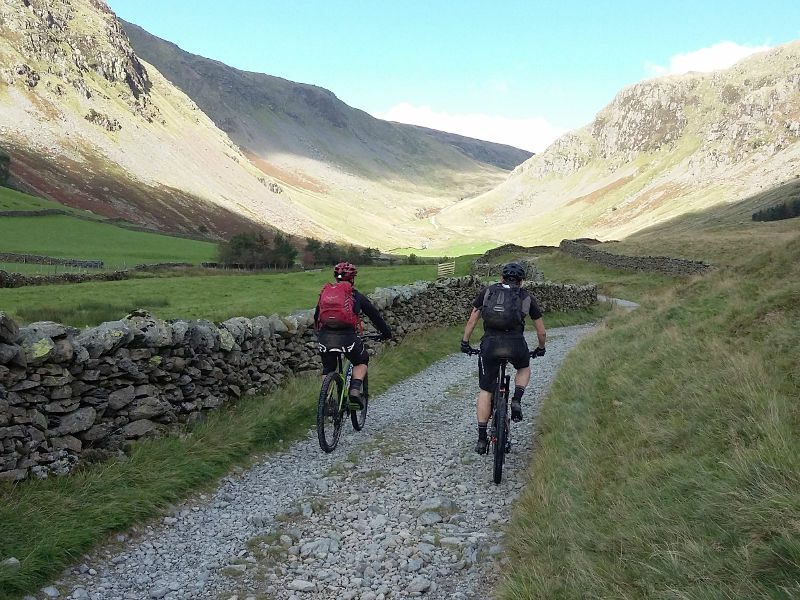 Take care as the grass gives rise to higher speeds but the trail still contains technical sections in the form of boulders, steep sections and eroded earth. It can also be a bit boggy in places when wet. The descent ends at a gate that leads directly onto a stream crossing (GR456070). 9. Bear right and cross the stream using the rocky ford or the stone bridge then descend the rocky double track. Go through a few gates and follow the trail in the direction of the bridleway markers, keeping high of the double track that can eventually be seen lower down on the right. The trail becomes vague near the end as it passes through a couple of fields. Keep going straight on through the bottom of the fields until the trail comes out at a junction with a lane by Overend farm (GR464058). 10. Turn left then onto the lane then immediately after go through the gate, marked as a bridleway, to the right of the lane that climbs off left. 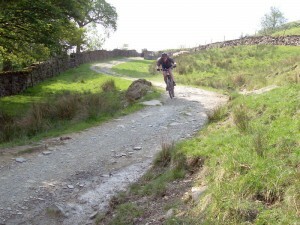 Follow the track into the trees and through a couple of gates to a junction with a rocky double track trail. Turn right at the junction then descend the main track through a left hand bend. A short distance later, where the double track turns right through a gate, go straight on, keeping to the wall on the right, and continue straight on down the valley. Continue ahead along this track until it finishes at a junction with a lane (GR461044). 11. 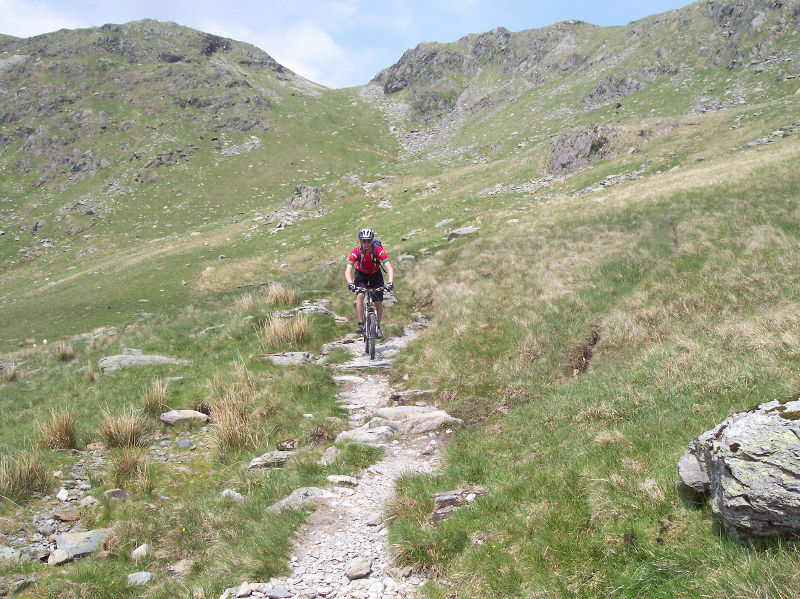 Turn right on this previously ridden lane and descend to the next junction, on the edge of Kentmere. Go straight on and climb through a left hand bend to a junction. Turn right and descend the lane all the way to a junction in the bottom of the valley (GR458036). Turn left and follow the lane down the valley. Go past Millriggs farm on the left and then through the trees. 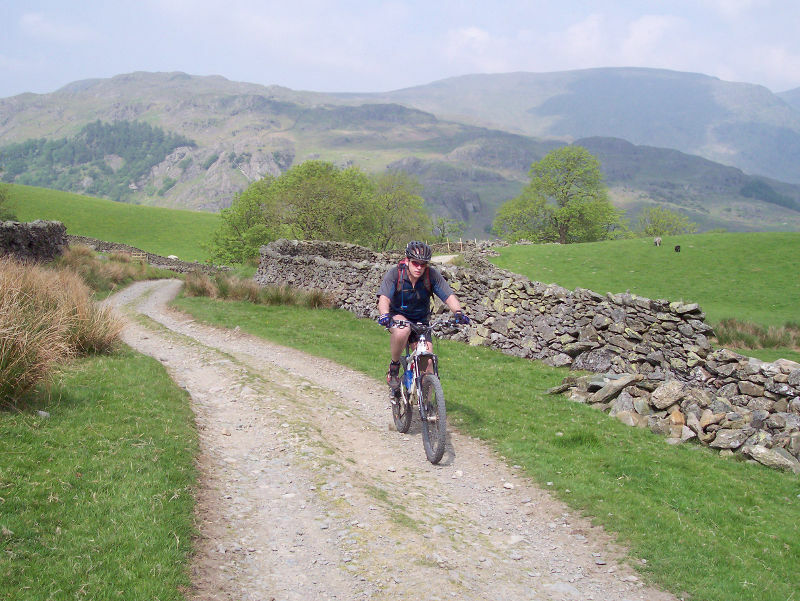 Go past the first junction on the right then a bridleway on the left. At the next junction on the right, marked as a bridleway, turn right and follow the lane over the stone bridge (GR456012). 12. Directly after the bridge turn left and follow the rocky double track along the right hand side of the river. The track eventually bears right and climbs to some buildings. Climb straight ahead between the buildings, past the right hand side of the house, and up a short, steep finish to a junction with a lane (GR454007). Turn left and follow the lane down the valley, on the right hand side of the river, to a junction with a bridge on the left. Go straight on and follow the lane back into Staveley. Follow the lane straight on through the village to a forked junction at a white house ahead (GR470986). Follow the lane right to a junction with the main road through the village a short distance later. 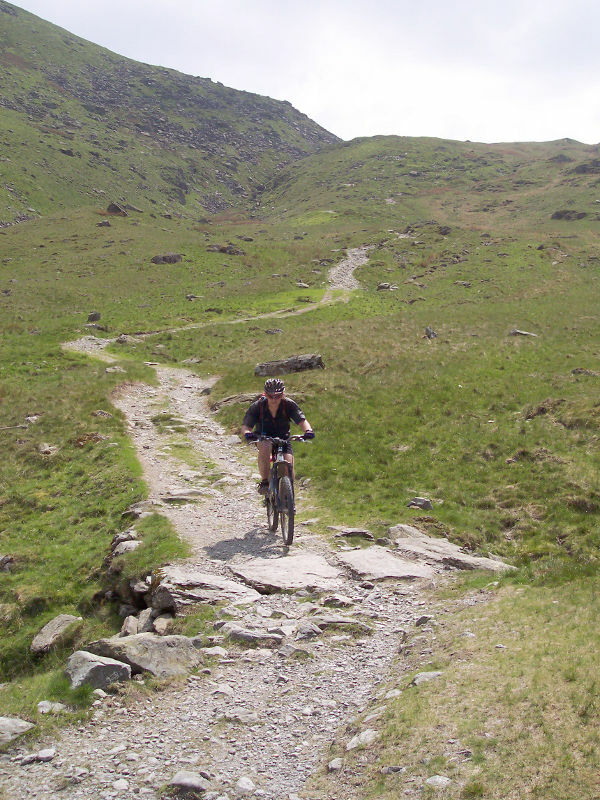 Bear left and follow the road to the next junction then turn left to the Mill Yard car park to complete the ride. Not only is there a bike shop at the start of the ride, there is Wilf’s café, Hawkshead Brewery and More? Artisan Bakery. Not far away in the village is a Spar and local shop, both good for buying trail food.